As I (sadly) finish up my final days in Florence, I’ve been reflecting on the lessons I’ve learned and the memories I’ve made. Four months ago, as I was finally packing for my semester abroad, I truly had no clue how much I would gain from this experience. When asking past study abroaders for advice, I thought it was all a cliche, “The most amazing experience of my life”, “I grew so much “, “You’re never going to want to leave”. But now, I realized just how right they were. Studying abroad has been the most fun and challenging time of my life. For future study abroaders, words can’t describe exactly what you’re about to experience. Everyone’s time abroad is different so my first piece of advice is to dive right in. Make sure you say “Yes!” to as many opportunities as possible, and also take into consideration a few extra tips I have for you. Eat the gelato. One of the craziest things I’ve heard here is people worrying about gaining the “study abroad” weight. I think I’ve gained atleast 10 lbs and I couldn’t be happier. You’re studying abroad in Italy, the home of carbs, so let yourself splurge. Enjoy the pasta, order the panini, get the bigger cup of gelato, you only have 4 months here and your treadmill will be waiting for you back home. I know I will be missing Osteria Santo Spirito’s Truffle Gnocchi the second I’m back in the states. Learn some Italian. Although Florence is extremely English friendly, learn and use some Italian vocabulary. Not only will it help you immerse yourself into your new city, it will be extremely respectful to locals. Even if you can barely pronounce a word, your waiter will enjoy the effort. I really only knew “Ciao” and “Grazie” and seemed to survive, but I think I really could’ve benefited from a few more phrases. Ask questions. The best advice you can get about Florence is from the locals. Yes, the Florence Study Abroad Bibles are extremely helpful, and some of my favorite restaurants are on them, but the most valuable advice you can get is from the people who truly live here. Become friends with the bartenders, stop by the FlorenceForFun office, ask an Italian on the streets, work through the awkward language barriers and discover a hidden Italian gem. Get lost and explore your new home. Within a few weeks, you may think that you have seen a majority of Florence, but, you are wrong. Up until my last week, I found myself constantly stumbling upon new restaurants and even cuter little Italian art studios (if thats possible). Be sure to stay in Florence for a few weekends. Give yourself time to wander through the side streets and make your way across the river. Just a 15 minute walk can take you to a completely new part of the city. Be a little selfish. You only study abroad once. There’s a million and one things to do while abroad in what seems like an incredibly short amount of time. Be selfish. Do exactly what you want to do and make the most of it. If you want to travel somewhere your friends don’t want to travel, travel alone! If you want to go out- run to Kakuya and make some new friends. Everyone has different wants and needs while studying abroad, so make sure you make the most of your experience without constantly worrying about following a group. Take it all in. Finally, I encourage all study abroaders to truly take it all in. Of course while traveling getting a million pictures and the perfect Instagram is a must. But, my advice is to take the pictures, set the phone down, and look around. You’ve made it! 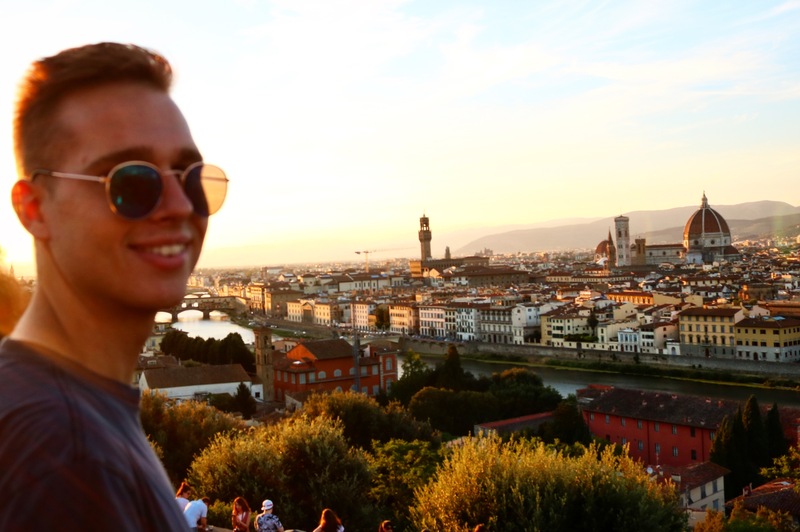 You’re spending four months in Florence, an incredible city with amazing people. Before you know it, you’re going to be in my position, wishing you could rewind and start the best semester of your life all over again. Enjoy it, it goes by in the blink of an eye.